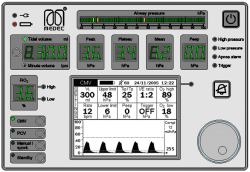 Neptune is Medec’s most compact anaesthesia ventilator. It’s a fully equipped system with a powerful bag-in-bottle ventilator, capable of handling a wide range of patient categories: neonates, infants and adults (incl. bariatric patients). Neptune is designed with the focus on patient safety, reliability and cost efficiency. It comprises some unique safety systems (e.g. VoluProtect® and BaroProtect®), it’s a durable piece of equipment (high-grade materials) and reduces the cost of ownership to a strict minimum (e.g lifetime warranty on the flow sensor). The straightforward user interface with ergonomically positioned keyboard controls and rotary knob make for smooth sailing throughout the anaesthetic procedure. The 6 inch monochrome display shows the pressure waveform and the selected parameters. The surrounding LED displays show the measured parameters, the oxygen concentration and the pressure barograph per breath. 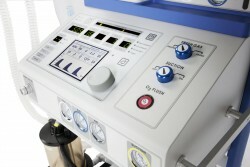 Easy access to the keyboard controls and rotary knob make for a straightforward anesthesia ventilator. Ventilation parameters can be preselected in the setup menu to adapt Neptune to your individual approach. To easily monitor the remaining volume of backup oxygen and/or nitrous oxide two pressure gauges are ergonomically located directly above the ventilator controls. 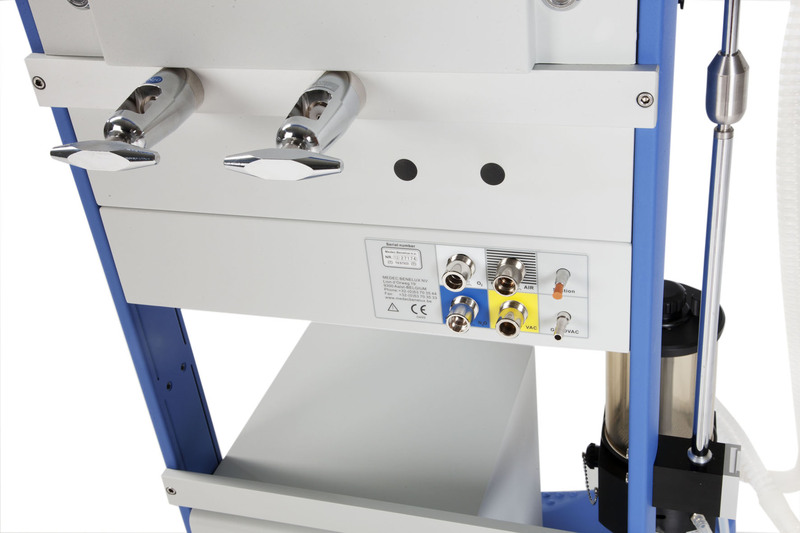 Its slim design makes it an ideal solution for even the smallest of operating theatres. With its reduced footprint space allocation is no longer an issue. A writing shelf (option) can be installed to extend the working surface. Neptune also has a top shelf to accommodate the vital signs monitor. 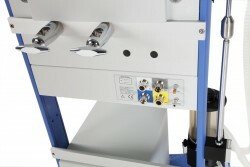 At the backside of the unit two gas cylinders can be fit onto the trolley with separate pressure regulators (option) or with pin-index yokes (option). 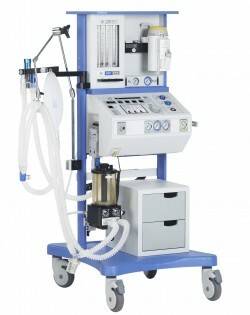 Neptune comes with an integrated airway suction system, which operates on a medical vacuum system. VoluProtect® reduces the risk of ventilator-induced lung injury during manual or spontaneous ventilation. Clinical research has shown that sustained lung pressure at a critically high level can cause irreversible damage to lung tissue. VoluProtect® is designed to prevent this and to improve patient outcome. It effectively prevents volutrauma by reducing the lung pressure automatically in case of an inadvertently closed APL valve. BaroProtect® reduces the risk of ventilator-induced lung injury during volume-controlled ventilation. It effectively prevents barotrauma by limiting unexpected pressure spikes (e.g. due to changing lung compliance). At the same time, a full breathing cycle is completed without any risk of barotrauma. BaroProtect® assesses each individual patient’s respiratory functionality to determine the pressure level at which it is activated automatically. 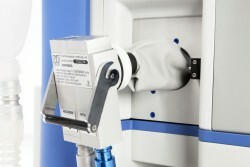 Medec was the first to introduce the balanced bag-in-bottle ventilator. It’s a pneumatically driven, electronically controlled system and it can use oxygen or air as drive gas. When compressing the internal bag with drive gas the breathing gas is pushed towards the patient’s lungs using a positive pressure. Exhalation is a completely passive process, which allows the patient to exhale spontaneously. Medec’s balanced bag-in-bottle ventilator provides a very natural approach of lung ventilation. In case of emergency Neptune can easily continue ventilating. The backup battery guarantees a minimum of 4 hours. In case of complete power and battery failure Neptune still supports manual ventilation with administration of anaesthetic agent. Even without power the ORC and nitrous oxide cut-off maintain full functionality. Backup gas cylinders (option) for oxygen and nitrous oxide can be fitted onto the trolley for continued ventilation.